The story begins in Uruk, a city in Ancient Sumer (Mesopotamia) where Gilgamesh rules as king. Though Gilgamesh is known to be stronger than any other man, the people of Uruk complain that he abuses his power. The gods hear these complaints, and the god Aruru creates Enkidu, a man as strong as Gilgamesh. Aruru forms Enkidu out of water and clay, out in the wilderness. Enkidu lives in nature, in harmony with the wild animals. Eventually a trapper discovers that Enkidu has been destroying his traps. The trapper describes Enkidu as the strongest man in the world. Both the trapper’s father and Gilgamesh tell him that when Enkidu sleeps with a woman, the animals he lives with will reject him. The trapper then brings a temple prostitute, Shamhat, to Enkidu, and she seduces him. Afterwards, when Enkidu returns to the hills where he lives, the animals run away from him. Enkidu eventually travels to Uruk and blocks Gilgamesh’s way while walking in the city. They wrestle, but Gilgamesh beats Enkidu. They each commend each other’s strength and declare themselves friends. Because of a dream he has that Enkidu interprets, Gilgamesh realizes that he has not yet made a name for himself. He pledges to travel to the Land of Cedars and slay the giant Humbaba who guards it. With the help of Shamash, the sun god, Gilgamesh and Enkidu defeat Humbaba. Humbaba pleads for forgiveness, but Enkidu delivers the killing blow. Ishtar, the goddess of love, invites Gilgamesh to her palace and proposes marriage. Gilgamesh turns her down, however, because she treated her previous lovers badly, often turning them into animals. Enraged by his refusal, Ishtar threatens to smash the doors of hell and release the dead unless her father, Anu, releases the Bull of Heaven to destroy Gilgamesh. Because of her threat, Anu does so. The Bull of Heaven wreaks havoc in Uruk, killing many, but Gilgamesh and Enkidu defeat it. The following night, Enkidu has a dream of the gods gathered together and agreeing that one of the two (Enkidu and Gilgamesh) must die for the killing of Humbaba and the Bull of Heaven. Enkidu grows increasingly sick. Gilgamesh and the people of Uruk mourn Enkidu as he dies. Again Gilgamesh journeys out into the wilderness, now hoping to find the legendary Utnapishtim, who survived a great flood many years before and was granted immortality. After crossing a mountain range that no man has ever crossed before, Gilgamesh arrives at the Garden of the Gods. Siduri, whom Gilgamesh meets in the Garden of the Gods, warns Gilgamesh that he will not cross the sea. Gilgamesh then searches for Urshanabi the ferryman, and in his anger Gilgamesh smashes an essential piece of Urshanabi’s boat. Urshanabi tells Gilgamesh to prepare 120 wooden poles for their journey, and they set off. After crossing the sea, Gilgamesh meets Utnapishtim on an island and asks him how to seek immortal life. Utnapishtim says that Gilgamesh will not find immortality, and he tells Gilgamesh a story: Long ago, in a city called Shurrupak, the god Enlil grew sick of the city’s noisiness and created a flood to destroy mankind. But one man, Utnapishtim, received instructions in a dream from the god Ea, saying to build an enormous boat. Sure enough, the flood came, and Utnapishtim, his family, his animals, and his craftsmen were safe. They all stayed at sea until a bird they released did not come back to the ship, having presumably found shore. The gods criticized Enlil for punishing mankind too harshly, and in return he granted Utnapishtim his immortality. Utnapishtim tells Gilgamesh that he must stay awake for six days and seven nights to get the sympathy of the gods. After the time has passed, Gilgamesh believes he has stayed awake the whole time, but Utnapishtim had marked each day with a fresh loaf of bread, and now one lies moldy and uneaten, meaning that Gilgamesh slept. Utnapishtim banishes the ferryman Urshanabi from ever returning to his island and tells him to bring Gilgamesh back across the sea. Before they depart, Utnapishtim’s wife says that there is a plant that grows under the sea that can restore youth. Gilgamesh ties rocks to his feet and walks along the bottom of the sea until he finds the plant. That night, however, Gilgamesh bathes in a well, and a serpent jumps out of the well and snatches the plant, then disappears into the water. Gilgamesh and Urshanabi then cross the sea back to where they originally came from and travel to Uruk. There, Gilgamesh feels proud of the great walls he built, and we learn that Gilgamesh will be remembered for a long time as having brought the story of the flood (which he recorded on tablets, with the rest of his adventures) to the people of Uruk. Glasserman, Ethan. 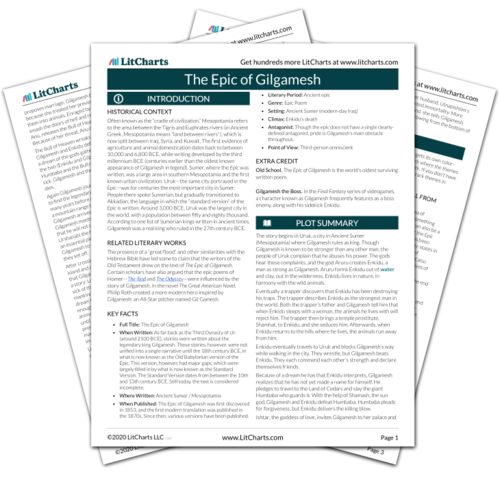 "The Epic of Gilgamesh Plot Summary." LitCharts. LitCharts LLC, 9 May 2016. Web. 24 Apr 2019. Glasserman, Ethan. "The Epic of Gilgamesh Plot Summary." LitCharts LLC, May 9, 2016. 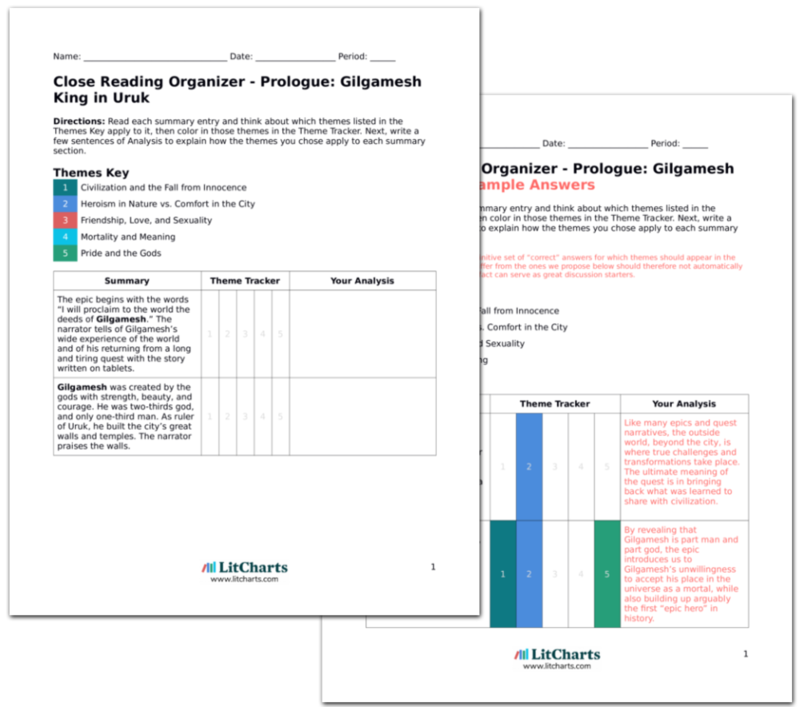 Retrieved April 24, 2019. https://www.litcharts.com/lit/the-epic-of-gilgamesh/summary.